Both the small and larger size bears and dolls fit this stand. Search through Bearington Collections Greeting Collection. Each Bearington Bear will bring a warm smile to your face as they greet you. The Greetings Collection features some bears for Mom, get well soon bears, spring bears and many more. Bearington Bears are highly collectable plush teddy bears. Find limited edition 2011 Fall Collection Bearington Bears. 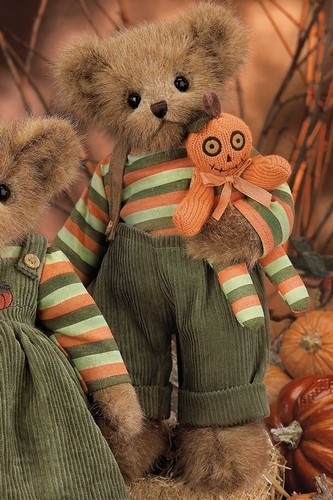 Buy these new Fall Bearington Bears such as Brewster and Rooster or Pauley and Punkin’ now. Find Retired Bearington Bears only available in limited quantities. Hurry to buy before supplies runs out of these highly collectable Retired Bearington Bears. These bears are no longer in production as they are limited edition collectables. Bearington Bears are highly collectable plush teddy bears. Find limited edition 2011 Spring Collection Bearington Bears as well as select retired Spring Collection bears. Buy bears, rabbits, and even monkeys all part of the spring collection line from Bearington Collections. Wisdom Owl is full of wisdom and proves it with his class of 2018 diploma. Wisdom is also wearing a graduation cap and a congratulations sash. The tag also reads Class of 2018 as Wisdom is fresh out of school this spring. Big Head Party Ted, the stuffed animal baby Teddy bear, is sure to capture your heart with his huge eyes, ultra soft plush, and lovable expression. This bear is perfect for a birthday celebration. You will love the fine detail award winning Bearington Collection uses to bring Lil' Puppy Tutu, the puppy dog dressed in bunny ears, to life. Hand crafted using the most luxurious, soft plush, this puppy is perfect for everyone for Easter from the collector to a special child in your life. You will love the fine detail award winning Bearington Collection uses to bring Tippy Toeshoes Ballerina to life. Hand crafted using the most luxurious, soft plush and with hand airbrushed detail, this teddy bear is perfect for everyone. This adorable Teddy bear has the design of a classic bear, with the softness of modern plush. Peace Teddy bear includes a pair of angelic wings and is the perfect size for cuddling. Peace is sure to become a treasured companion. Both the small and larger size bears and dolls fit this stand.